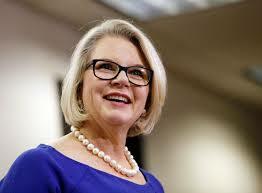 Newly appointed president of the University of North Carolina system, Margaret Spellings -- may we call you "Maggie"? -- has already launched her charm offensive with a university system that already resents her for the secretive way she was selected and dreads her for her partisan political marching orders from a 100% Republican Board of Governors, backed up by the most regressive, anti-education General Assembly in the nation. Gosh. Spellings can quote Bill Friday! And Spellings makes cooing sounds: “People know in their gut, and particularly in this state – irrespective of where you are on the political spectrum – everyone understands the value of this institution to the success of this state,” she told the reporter. "Righteousness" here must be the code word for "sincerely held but wrong beliefs." That's the kind of language you use to charm a snake. At a salary of three-quarters of a million dollars per annum -- not counting other perks, like free lodging -- she'll at least look good. Irrespective of everything else. Spellings' experience in higher ed is in student debt collections and for-profit higher ed sector. She implemented No Child Left Behind for GW Bush. There is NO WAY her appointment can be viewed as anything other than a statement of utter disdain for what the UNC-system actually stands for - providing quality public higher education for those who cannot afford to spend $60K a year on tuition and room and board. The UNC BOG are working very hard to destroy the system they are supposed to support.